We want you to be inspired, just like we are. Every day, we’re travelling the world and seeing moments that inspire us. They remind us why we travel, and why we keep developing new tours for our travellers. You can walk the streets of a distant city a hundred times, and still find ways to see it from a new perspective. You can travel somewhere you never expected to go, and find that it’s a piece of you that you didn’t even know you were missing. When you open this travel guide, and begin to discover our new tours, you’ll know that these are the places you’ll need to go next. I want to , and I truly believe travel has the power to do that. Year after year, our tour designers dedicate themselves to bringing you the best experiences in travel. That’s because there’s always something fresh and new for our travellers to see. WHAT DO OUR TOUR DESIGNERS LOOK FOR WHEN THEY’RE OUT IN THE WORLD? •M  aking sure the must-see sights are truly must-see. •T  racking down incredible on-tour cultural experiences. • Seeking out unique and delicious culinary experiences. •F  inding perfect 4-star and above accommodation in the perfect locations. • Crafting the tour itinerary for the ideal pace, with plenty of free time. 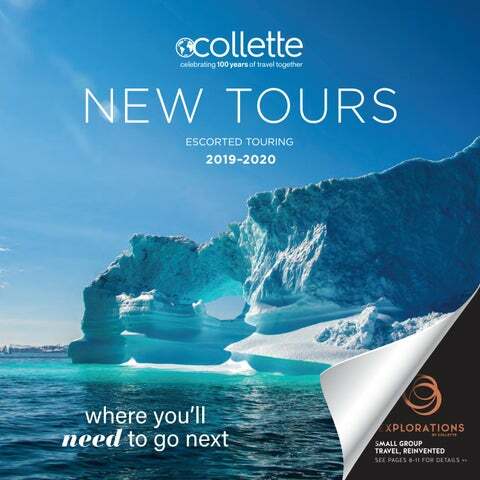 Collette’s Classic tours open the door to a world of amazing destinations. Marvel at must-see sights, sample regional cuisine, stay in centrally located hotels and connect with captivating cultures. These itineraries offer an easy way to experience the world. Collette’s River Cruises are a slower, more intimate way to explore the world. These adventures, on small 4-star vessels, are an easy way to travel through the world’s beautiful waterways. Unpack just once and explore the world’s most iconic cities during Spotlights’ single-hotel stays. The leisurely pace offers you the chance to get to know these destinations like a local. Must-see cultural highlights are always included, plus there’s plenty of time to explore independently. This is your time to head off the well-known path and appreciate all the extraordinary moments held in the everyday. It’s time to wander, to wonder, and to awaken your soul. It’s time to experience small group travel, reinvented. It’s often said that experience is the best teacher and we couldn’t agree more. Experiences help educate us as travellers about cultures, traditions, and the human spirit. It’s why we take the time to include truly exceptional experiences on Explorations. Some experiences are active and even a little adventurous, some are designed to reveal the heart of a culture, and some may even have the power to change your life. Hard to replicate, and impossible to forget, these experiences will help shape your understanding of a destination, and shape your vision of the world. and connect to the world in a more authentic way. rest up and rejuvenate during your travels. Each hotel (4-star and above) is carefully chosen to ensure that your exploration never stops. Whether it’s the history, the view, the location, or the amenities, your hotels will capture the spirit of your destination. These are but a few of the types of places you can expect to stay with Explorations. Visit explorations.com to see specific hotel details for your trip. will savour the local flavours of your destination. plenty of opportunities for “you” time. FIND AN IDEAL BALANCE OF GUIDED AND INDEPENDENT EXPLORATION We’ve built in extra days just for you in three unique cities. Get the lay of the land first with guided walking tours and experiences, then take time to wander the streets, check out a museum using your Swiss Travel Pass, or get your heart pumping with a little activity. Be sure to turn to your LEAD for suggestions! IN NEUCHATEL, ZERMATT, AND VEVEY. SWITZERLAND: HIDDEN TRAILS AND MAJESTIC PEAKS Set your sights on an active, immersive journey across Switzerland from the soaring Alps to the picturesque Swiss Riviera— all while travelling by train. *Price based on 5 October 2019 departure. Per person, double, land only. Visit explorations.com/628 for complete tour details. Let Neuchatel’s History Enchant You •	Meet up with your fellow explorers for a reception in the centuries-old cloister of the Collégiale. •	Get to know Neuchatel, a hidden gem of a city totally off the tourist map. Take a walking tour of the city’s historic quarter and drink in gorgeous views of Lake Neuchatel from your hotel room. •	Enjoy a full day at leisure to explore Neuchatel and its surroundings. •	Spend some time exploring Switzerland’s capital of Bern. complemented by stunning views of Lac Léman. >> EXPERIENCE THIS ON DAY 7 IN LAVAUX. •	Enjoy a full day to wander pedestrianfriendly Zermatt at your leisure. Consider taking the Gornergrat Railway for stunning views of the Matterhorn! •	Stroll the streets of Vevey on a guided walking tour. •	Get a behind-the-scenes glimpse into the artistry of handmade Swiss chocolate during an immersive tasting workshop at Läderach. •	Enjoy time at a family-run winery, then continue on with a walk along Lavaux’ World Heritage vineyards. On this journey, we’ll only travel via the brilliantly efficient Swiss Rail Service. Your First-Class Swiss Travel Pass also lets you access museums, cultural exhibitions, local ferries, scenic trains, mountain trams, and more. WITH YOUR SWISS TRAVEL PASS. The epicentre for wars and sieges, love and betrayal, poetry and legend, Castello di Tabiano is a living connection to Parma’s past. Wander the grounds, take a private tour with a local expert, and slowly fall under its captivating spell. Then, retreat to your room on the castle’s grounds and soak up the rich history that abounds from this centuries-old defensive monument. >> EXPERIENCE THIS ON DAY 5 IN PARMA. *Price based on 14 July 2019 departure. Per person, double, land only. Visit explorations.com/629 for complete tour details. and explore the castle’s family-run vineyard on foot. >> EXPERIENCE THIS ON DAY 2 IN FLORENCE. INDULGE IN A LITTLE HOME COOKING There’s no match for home cooking, and that rings truest in Italy. In the cozy surrounds of a private apartment in Bologna’s historic centre, you’ll roll up your sleeves and learn the secrets to making three traditional pasta recipes. Enjoy the fruits of your labour over dinner, paired with local wines and accompanied by espresso with dessert. >> EXPERIENCE THIS ON DAY 3 IN BOLOGNA. •	Savour a quintessentially Italian experience, the aperitivo, when you learn to craft one of Italy’s most famous cocktails, the Spritz. winding alleys on a bicycle tour. •	Take a walking tour through hundreds of years of Florentine history and discover the city’s beating heart. •	Take a full day on your own to feel the unique vibe of Bologna, a city steeped in the past, but very much alive with an eclectic presence. •	Join a local expert for a Vespa tour of Tuscany’s countryside before relaxing with a glass of wine at a castle. •	Experience the workings of a local cheese shop and sample the Parmigiano-Reggiano this region is famous for. •	Cruise to Bellagio. Take a tour of the “Pearl of the Lake,” then spend the afternoon independently exploring. •	Join your guide and catch a sunrise funicular ride to watch the lake wake up, then explore Como’s lakeside trails and frescoed hamlets on foot, or remain at the hotel to relax. ADVENTURE IS BREWING IN COCORA VALLEY Feel the wind in your hair and spy vivid green as far as you can see as you ride through Cocora Valley in equipped 4x4 jeeps known as “Willys.” Afterward, choose your next adventure. Hike the valley with a guide, pausing to look up at the sky-high wax palms or travel on horseback to see the valley through the eyes of a Colombian farmer. >> EXPERIENCE THIS ON DAY 4 IN COCORA VALLEY. *Price based on 10 June 2019 departure. Per person, double, land only. Rates include inter-tour air. Visit explorations.com/630 for complete tour details. Feel the Beat of Bogotá •	Get to know the city on a lively walking tour. •	Explore the artifacts at Museo del Oro. •	Stroll Paloquemao Market’s rainbow displays while your guide dishes out some favourite samples. Breathe in the Coffee Region’s Splendour •	Learn about the coffee-making process and sample the perks of the region, bean to cup. intoxicating energy, and a haven for foodies. >> EXPERIENCE THIS ON DAY 2 IN BOGOTÁ. •	Enjoy a locally sourced picnic lunch. •	Explore Salento on your own, discovering quaint streets, local artisans, and paisa architecture. Behold Medellín’s Vibrant Spirit •	Dine with the locals in the city of Medellín and indulge in a specially cultivated tasting menu. •	Join a local resident for a poignant walking tour through the vibrantly muraled neighbourhood of Comuna 13. •	Meet with a silletero and learn firsthand what a “day in the life” of a flower farmer is like. of Comuna 13’s past, present, and promising future. >> EXPERIENCE THIS ON DAY 6 IN MEDELLÍN. *Price based on 8 November 2019 departure. Per person, double, land only. Be Enchanted by Barcelona & Pamplona •	Walk the halls of the famous La Sagrada Família Church and Towers. •	Make a few signature Catalan dishes at a hands-on workshop led by locally acclaimed chefs. •	Discover Barcelona on a guided tour of the city, then enjoy free time to explore on your own. Visit explorations.com/624 for complete tour details. •	Learn about Pamplona’s history and ties to the San Fermin festival during a discussion with a local expert. join a guided tour of the city’s old town and ascend Mount Igueldo aboard a funicular Or set out for a guided walk through the farms, vineyards, and villages along the Coastal Camino route. flavour at your fingertips. Learn the secrets and techniques to crafting regional favourites like paella, and enjoy the fruits of your labour for dinner. >> EXPERIENCE THIS ON DAY 2 IN BARCELONA. San Sebastian by joining a guided tour of the old town and Monte Igueldo, or, take a walking tour along the Coastal Camino. •	Enjoy a full day of leisure to explore San Sebastían on your own terms. •	Witness centuries of history unfold before your eyes during a walking tour of Burgos. •	Enjoy a leisurely afternoon in Burgos to explore how you wish. •	Settle in for an unrivalled history lesson as you spend two nights in a former 16th-century convent. Led by a local chef and his keen-sensed dogs, this culinary adventure takes you through the countryside of Southern France on an exciting hunt for black truffles where they naturally grow. Après hunt, savour local farm offerings from throughout the countryside. >> EXPERIENCE THIS ON DAY 7 IN GORDES. *Price based on 23 July 2019 departure. Per person, double, land only. Visit explorations.com/568 for complete tour details. >> EXPERIENCE THIS ON DAYS 3 & 4 IN DORDOGNE VALLEY. DISCOVER THE CHARM OF SAINT-ÉMILION Journey back into the past as a tuk-tuk brings you through the quaint, charming medieval village of Saint Émilion. Drink in the Beauty of Bordeaux •	Enjoy a locally sourced meal paired with the region’s famed wines. •	Explore the city with a local guide. •	Embark on a full-bodied exploration of wine culture at La Cité du Vin. •	Walk the grounds of a local winery in Medoc and absorb the atmosphere of the vineyards, smell the grapes, and taste locally grown wine. Step into a Storybook in Carcassonne •	Enjoy an independent exploration of the medieval city of Carcassonne, a UNESCO World Heritage site replete with drawbridges, towers, and cobblestone streets. Saint-Émilion, one of Bordeaux’s largest winemaking areas OR take a guided walking tour of the Old Town. •	See a slice of everyday life with a stop at a lively local market, followed by a visit to Chateau Monbazillac, a wine cooperative known for its signature dessert wine. •	Spend an afternoon relaxing and enjoy your chateau’s luxurious spa or explore the grounds at your leisure. •	Gain an inside look at the village of Avignon during a walking tour with a local expert guide, ending with a visit to the dramatic Palace of the Popes. •	Join a local chef and his keen-sensed dogs as you hunt for truffles in the forests of Gordes. •	Learn more about Southern France’s famed lavender at Musée de la Lavande. •	Enjoy free time to explore the Provençal charm of Saint-Rémy-de-Provence. SEE THE ACROPOLIS, up close or from a distance. • E xplore Delphi and tour the Sanctuary of Apollo, the Doric Temple, the ancient theatre, and the Delphi Museum. • Delve into the ancient city of Mycenae during a guided visit of the excavations featuring the Beehive Tombs and the Lion Gate. • E xplore the picturesque seaside resort of Nafplio. Visit COLLETTE.COM/635 for more details. • In the imperial city of Meknes, see the famous ancient door of Bab El Mansour, and the Bab El Khamis flea market. • E xplore Marrakech and its ancient El Bahia Palace, visit the vibrant Jewish Mellah, and see the majestic 12th-century Koutoubia Mosque. • Travel to Casablanca, to tour the Hassan II Mosque, and dine at the legendary Rick’s Café, from the film Casablanca. Visit COLLETTE.COM/632 for more details. Look out over Pointe du Hoc, a fortified German position on D-Day that is now an otherworldly landscape, pockmarked with artillery craters. • Visit Juno and Sword Beach, where Canadian and British soldiers fought through a deluge of air, sea, and land offenses. • Visit both the Bayeux Cemetery and Memorial and the Normandy American Cemetery. • Spend the afternoon at leisure and discover one of the world’s great cities, Paris. • Take a walking WWII-themed tour of Paris, including the Vel d’Hiv, Grand Palais, Invalides, and the Ecole Militaire. • Dine inside one of the world’s most iconic landmarks, the Eiffel Tower. Visit COLLETTE.COM/502 for more details. CRUISE to the Iceberg Capital, ILULISSAT As your ship makes its way to dock outside Ilulissat, you’ll discover icebergs floating along the icy waters of the Ilulissat Icefjord (UNESCO). • E xplore Reykjavík during a guided walking tour, and see the Hallgrimskirkja Church and the Harpa Concert Hall. • Enjoy time at leisure to take a dip in the mineral-rich waters of the famous geothermal pool, the Blue Lagoon. • Travel the Golden Circle and see many of Iceland’s natural wonders like Thingvellir National Park and Gullfoss Waterfall. • Board your ship, the MV Ocean Atlantic, and glide through the frosted waters of the Kangerlussuaq fjord. • On a walking tour through Sisimiut, you’ll discover the Colonial Quarter, Sisimiut Museum, and the iconic Blue Church. • E xplore the remote settlement of Itilleq, where only about 100 or so people live, making their living off the land. • Make your way to Kangerlussuaq, and be dazzled by panoramic views of snow-capped mountains, deep valleys and raw tundra. Visit COLLETTE.COM/639 for more details. Dine with the BEST VIEWS OF PARIS Settle in to an elegant dining experience inside a landmark known the world over â&#x20AC;&#x201C; The Eiffel Tower. • Enjoy a full day to explore Paris independently, or, choose to go on a locally-led tour of the Louvre. • Discover why Lucerne has been rated Switzerland’s most beautiful city during a leisurely walking tour. • Tour Florence and see the Piazza del Duomo, the Cathedral of Santa Maria del Fiore, and Michelangelo’s David. • Bask in the cultural treasures of Rome like the Piazza Venezia, the Roman Forum, the Circus Maximus, and the near-mythic Colosseum. • Discover more of Rome on your own time, and enjoy a full day at leisure, or, you may choose to join an optional tour to the Vatican. Visit COLLETTE.COM/636 for more details. • Board your ship and unpack once for a relaxing 7-night river cruise. Your beautiful vessel offers a panoramic deck and bar, delicious cuisine and wines, and outstanding service. • Embark on a tour of Auvers-surOise, and retrace Van Gogh’s time here, including touring the idyllic fields that inspired his last masterpiece. Visit COLLETTE.COM/638 for more details. BEAUTY 300 MILLION Years in the Making Explore and discover the geological nuances of the worldâ&#x20AC;&#x2122;s largest concentration of natural sandstone arches at Arches National Park. • E xplore and discover the world’s largest concentration of sandstone arches on a hike through Arches National Park. • Immerse yourself in Canyonlands National Park, a sublime and solitary wilderness and Utah’s largest national park. • Spend an entire day exploring the red and white sandstone cliffs of Zion. • On Zion’s open-air tram, wind along the Virgin River through the 2,400 feet deep, half-mile wide Zion Canyon. • E xperience the neon glow and raucous glamour of Las Vegas, Nevada. Visit COLLETTE.COM/634 for more details. Soak in the SMOKIES’ NATURAL GRANDEUR In the Great Smoky Mountains National Park, stand in awe of the beauty and majesty of America’s wild side. • Stop in Berea, Kentucky, a historic college town known as the arts and crafts centre of the state, and home to artisans, artists, and musicians. • Enjoy lunch at Boone Tavern, where blue grass country meets the rolling hills of Appalachia. • Take a panoramic tour of charming Asheville, North Carolina, seeing the architecture, neighbourhoods, and eclectic arts districts. • Tour the sprawling mansion of the Biltmore Estate and the immaculately manicured grounds, and experience life as a Gilded Age tycoon. Visit COLLETTE.COM/59 for more details. Carve out Time For BANDELIER NATIONAL MONUMENT See the spectacular cliff dwellings of the Pueblo people of the southwest, carved into the rocky mountainsides in the 15th century. • Take a locally guided walking tour of Santa Fe’s Plaza, the historic heart of the city, with stops at the Indian Market and Palace Avenue. • Try your hand at making a tamale at the Santa Fe School of Cooking. • Take one of three walking tours, each with a different theme. Choose between art galleries, chocolatiers, or espionage history. • Travel the scenic Turquoise Trail to the village of Madrid, a ghost town turned eclectic community nestled in the Ortiz Mountains. • Visit the Allan Houser Sculpture Garden to view 80 works by the most renowned Native American artists of the 20th Century. • Go to Bandelier National Monument, home to cliff dwellings and ruins of Pueblo villages dating back to the 1500’s. • Visit El Santuario de Chimayo, the most important Catholic pilgrimage centre in the United States. • Take some free time to wander the village of Chimayo, known for its heirloom Chile peppers and famous weavers. • Wander the Museum of Indian Arts and Culture and the Museum of International Folk Art. • Use your Tour Manager as a personal concierge, and get recommendations on how to independently explore Santa Fe. Visit COLLETTE.COM/274 for more details. Meander the narrow cobblestone streets of Vieux-Montréal, or Old Montréal, dotted with galleries, cafés and historic landmarks. • From the comfort of your charming Vieux-Montreal (Old Montreal) hotel, get ready to embrace the Quebecois joie de vivre! • Join a local expert for a comprehensive sightseeing tour of Montreal highlights, and stop atop Mount Royal and take in spectacular city views. • Enjoy a privately guided tour through one of Montreal’s most famous landmarks, the NotreDame Basilica. • Put a modern twist on traditional Quebecois cuisine during an interactive cooking class at one of the city’s premier culinary institutions. Visit COLLETTE.COM/631 for more details. There’s a Whole World Out There This travel guide is just a sample of the many different and incredible travel experiences Collette can offer. Learn more about these destinations below by visiting us on the web. North America F rom the peaks of the Canadian Rockies, to the excitement of New York City, to the hospitality of the South, North America will amaze you at every turn. Europe Whether your interests are historical, culinary, scenic or a little bit of everything, our tours of Europe promise to deliver all that you seek and more. South & Central America Find yourself immersed in inspiring landscapes on a South America trip, from spectacular glacial fiords to the majestic Andes Mountains. Australia & New Zealand Beaches to “barbies,” koalas to kiwis, Outback to ocean, where do you begin on the country-continent of Australia, and the charming island of New Zealand? Asia Whether you’re looking for modern cities, ancient traditions, great food, wonderful art, or tropical paradise, Asia has everything you’re dreaming of. F rom encounters with the “Big 5” amid an unspoiled wilderness to the dynamic blend of cultures to the Pyramids of Egypt, Africa tours never fail to amaze. Antarctica tours are much more than a chance to get away. To some, it might mark the crowning achievement to years spent seeking out singular destinations. we will inform you of this and ask if you wish to make provision for your departure by booking a day room on your last day (time permitting). HEALTH AND SAFETY If you are taking prescription medication, please be sure to take an adequate supply for your tour and a few additional days in original prescription containers. Medication should be packed in your carry-on baggage (never in checked luggage). You may want to carry an extra prescription in case medication is lost. We operate a ‘No Smoking’ policy on all of our transport. During the tour, your transport will make frequent stops for the convenience of all guests. The Foreign & Commonwealth office produces up-to-date travel information to help British travellers make informed decisions about travelling abroad. For further information please visit; www.fco.gov.uk/knowbeforeyougo. Alternatively you can contact ABTA at abta.com. We recommend viewing health advice from the Department of Health and discussing with your own GP any specific needs you may have whilst travelling. The Department of Health is a source of information regarding health facilities, vaccinations, and up to date health information for travel including advice on Deep Vein Thrombosis. Please visit their website at www.dh.gov.uk for further details. SPECIAL ASSISTANCE Collette will make reasonable efforts to accommodate the special needs of tour participants. Persons requiring individual assistance must be accompanied by a companion who is capable of, and totally responsible for, providing the necessary assistance. Neither Collette personnel nor its suppliers may physically lift or assist clients onto transportation vehicles. Please ask your booking agent for a Special Assistance form if applicable. This form must be filled out and submitted to us at least eight weeks prior to your departure date so that we can make appropriate arrangements and inform your Collette Tour Manager. Please Note: It is a condition of your contract with us that you inform us before booking of any special assistance that may be required from Collette during your tour. You will be responsible for indemnifying us in relation to any costs we incur as a result of any failure on your part to do so. Facilities on tour to assist individuals with disabilities vary from country to country. LUGGAGE ALLOWANCE Due to limited vehicle capacity, one carry-on 36 inches/95 cms in length, height, and width; not to exceed 11 lbs/5 kg.) and one checked luggage (62 inches/160 cms in length, height and width; not to exceed 50 lbs/23 kgs) are allowed. Please note that these guidelines must be considered with the specific allowance permitted by the airline with whom you are booked to travel. If you exceed the limit of 2 bags, we cannot guarantee that your additional luggage will be able to fit in the vehicle. Storage or shipment of additional luggage will be at your expense. If we are able to accommodate your additional luggage, we will levy a £2.50 per hotel, per bag fee. Although every effort is made to handle passengers’ luggage carefully, we cannot be responsible, assume liability or accept claims for loss or damage to luggage and personal effects due to breakage, theft, or normal wear and tear that results from hotel, airline and group carrier handling. It is in your best interest to make certain you have adequate insurance to cover these eventualities. On safari tours, soft duffel bag luggage is required as storage space on safari vans is limited. 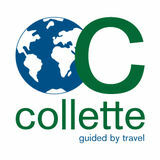 PLEASE GO ONLINE TO COLLETTE.COM FOR OUR CURRENT BOOKING CONDITIONS.